There is no acceptable "middle ground" with the left when it involves the Bill of Rights. To state the obvious just to get it out of the way, JPS's comments on "Repeal the Second Amendment" are obviously NOT "middle ground". SCOTUS has plainly stated that restrictions on types of guns are legal. So don't try to hide behind "Bill of Rights". It doesn't prevent what is repeatedly discussed regarding "middle ground". Only ground gained matters after which, the middle ground having been moved, the process starts all over again. Precisely the justification for those "fears." You have no freakin' clue how much circular logic you employ in that assessment. You justify your own fear, by repeating your own fear. As usual when confronted by your own false rhetoric you resort to juvenile insults. Your tantrum about me pointing out that you too are highly partisan after you wrote that my highly partisan nature prevented me from understanding is a good example. You never examine your partisan blinders. You follow dumb lies with dumb lies. Pointing out you are lying is not an "insult". And I have no problem admitting I have some pretty partisan ideas as well. We know from the Clinton era assault weapons ban failure to reduce crime assault weapons bans don't work yet Feinstein proposed another more expansive gun grabbing assault weapons ban using the bodies of children murdered at Newtown as human shields. She is the leading sponsor of another ineffectual assault weapons ban but she couldn't possibly have the ultimate goal of confiscation. In the same editorial Retired Justice Stephens advocates undertaking the arduous process of repealing the 2A as necessary to enact proper gun control laws he advocates banning semiautomatic guns. There was already an assault weapons ban on new sales and importation of proscribed semiautomatic rifles that withstood Constitutional challenge. Yet we are supposed to believe the former SCOTUS justice wants the 2A repealed so another gun ban permissible under the 2A can be enacted. No doubt the defenestration of your unfounded claims and speculation will trigger a new wave of personal attacks. Surprise us all by engaging in rational discussion for a change. As I've told you in the past, when you refuse to address my words I am going to refuse to address what I have no interest in addressing. I have been trying to engage in rational discussion but you have no interest in responding to what I'm actually saying. b) Attempt to derail the conversation with comments that are not relevant to what was actually said. My comment pointed out how Feinstein's bill lays the groundwork and creates the infrastructure for gun seizure but the reliably Left wing Polifact wrote that she didn't mean all guns, essentially trust us we'll respect the 2A in the morning. Wrong, Senator Feinstein stated explicitly she would have had the government confiscate all guns if she could. And you lack the honesty to admit that. So now you try to reinvent your claim while refusing to admit your previous lie. And the Politifact site documents its information so you don't have to just blindly trust them. Look at their evidence. But we both know they aren't lying so you just blindly attack the messenger. Yes, but only the types of guns that are not part of the ordinary military equipment, of a type not usual in civilized warfare or of a type that their use would not contribute to the common defense or of course a type that are not in common use by the citizens. But of course that's not what you meant . . . Because you can not allow yourself to argue the truth and actual law. Of course we on the gun rights side know what you are talking about, Heller's oft quoted list of "longstanding prohibitions" and most importantly, the "laws imposing conditions and qualifications on the commercial sale of arms" and it stands to reason, laws criminalizing certain simple gun possession and use. "As the Government concedes, Heller’s statement regarding the presumptive validity of felon gun dispossession statutes does not foreclose Barton’s as-applied challenge. By describing the felon disarmament ban as “presumptively” lawful, the Supreme Court implied that the presumption may be rebutted." On the other hand, hundreds of gun control laws that were upheld by citing the 1942 lower federal court opinions of Tot or Cases --which polluted the federal courts with "collective right" BS-- and reasoned upon the theories that the 2nd does not secure an individual right, are infirm and when examined, WILL BE STRUCK DOWN. Always remember, when you wish to misrepresent Heller that inconvenient facts get in the way, like footnote 26 and the fact that the Court said that the very enumeration of the right to arms takes out of the hands of government the constant reevaluation of it, and that constitutional rights are enshrined with the scope they were understood to have when the people adopted them, and that enshrinement necessarily takes certain policy choices off the table. So, your general statement that, "SCOTUS has plainly stated that restrictions on types of guns are legal" is at best, a purposeful over-reading and at worst, a blatant misrepresentation intended only to deceive. At this point it really doesn't matter which one, whatever credibility you think you had/have, is a mirage. Leftists just can't be trusted to be honest voices on the Constitution and SCOTUS holdings and the subset that are hostile to gun rights can't be trusted with anything, especially the protection original, fundamental rights. The principle of retained rights is anathema to the political model they want to impose on us. Last edited by Jeerleader; 04-13-2018 at 12:42 AM.. It has often been said in this thread that the number of Democrats that support the repeal/abolishment of the 2nd Amendment is very small. The surprise for me is in the age breakdown. 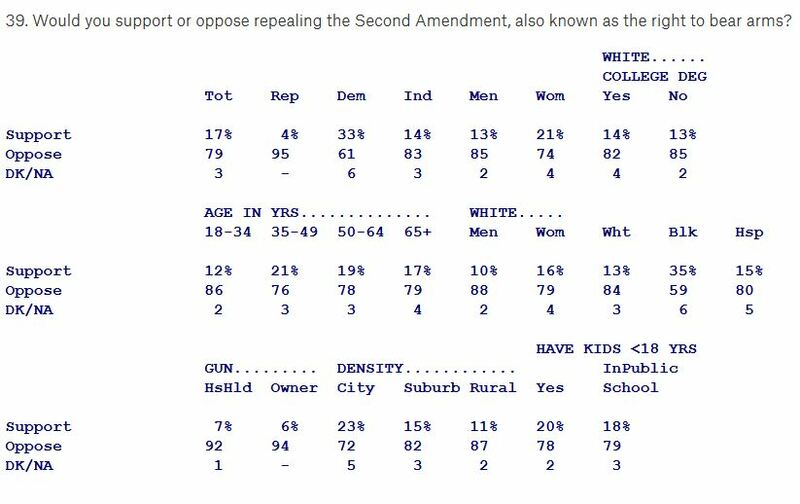 Millennials reject the idea of repealing the 2ndA at a higher rate than any other age group (86% oppose, 12% support. So much for the recent narrative being shoved down our throats about a major rejection of gun rights by young people. . . Gun grabbers criticize advocates of repealing the 2A because of the difficulties involved in amending the Constitution not for the wholesale restrictions on private firearms ownership it would permit. The survey question only permits a binary response masking the strategic goal of reducing legal firearms ownership to something that can only be attained by the very rich and well connected like Michael Bloomberg. Even the Parkland martyrs brigade leader David Hogg claims he is not in favor of repealing the 2A as he advocates more restrictions on gun ownership such as the ineffective assault weapons ban. The broader question of so-called stricter gun laws shows the gun grabber tactical approach. 38. Do you support or oppose stricter gun laws in the United States? We see that 84% of Democrats support the notion of stricter gun control laws despite not knowing what these laws might be. It sounds worthwhile so it is worthwhile despite there being no limit to additional gun control laws up to and including reducing the 2A to a meaningless ornament.